This week, Thanksgiving comes to the United States. If you’re looking for something fun to do with your students for those days leading up to the Thanksgiving holiday, here are some Common Core aligned math puzzles with packets for grades 1, 2, 3, 4 and 5. 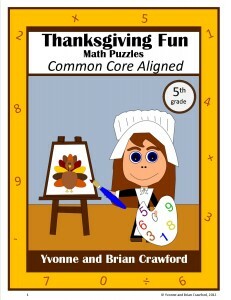 There also Autumn Common Core Math Puzzles available, with fall-themed puzzles for your students to solve. The math puzzles are designed to give students a challenging goal for which completing a series of math problems will achieve the result. Worksheets in this packet are designed to be independent; as such, your students can complete one activity per day over a series of days, or you can distribute worksheets as in-class activities or homework assignments. Math Number Search: Solve some addition and subtraction problems, then search for the answers in a grid full of numbers. Common Core standards: 1.OA.6, 1.NBT.3, 1.NBT.6. Common Core standards: 2.OA.2, 2.NBT.4, 2.NBT.5, 2.NBT.6. Common Core standards: 3.OA.7, 3.NBT.2, 3.NF.3. Common Core standards: 4.NBT.4, 4.NBT.5 4.NBT.6, 4.NF.2. Common Core standards: 5.NBT.3, 5.NBT.5, 5.NBT.6, 5.NBT.7. 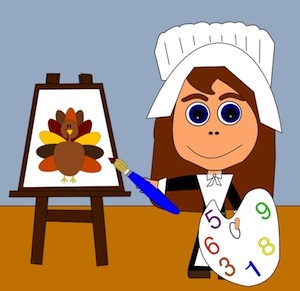 I hope that you and your students have a fun Thanksgiving week, and a great Thanksgiving holiday. Try not to eat too much!